This week is a holiday week for me, although I'm doing some schoolwork here and there (just the fun stuff!). So, I thought I would post a note here about something I've naturally been thinking about today: pacing the semester. Right now, my classes are more or less done... but that is because we have been working hard and steady already beginning in the first week of the semester! In my Myth-Folklore class, 28 of 56 students are completely done, and the rest are very close to being done, and the same in Indian Epics, where 14 of 29 students are done. I am always glad when people can finish up early because I know they are often doing most of the work in their other classes in a big push at the end of the semester - staying up all night to write those final papers, cramming for that final exam, etc. Well, that "last minute rush" is not how my classes work at all. Just the opposite! Instead, the projects students do in these classes are spread out over time, starting with several weeks of brainstorming, followed by alternating weeks of writing and revision, and then the three final two or three weeks consist of nothing but revision. That's a natural choice when students are publishing a web project (Google Sites is the web publishing tool I now use) instead of printing out a final paper! With a web-based project, of course it makes sense to revise (and revise and revise), to tinker, to evolve, working steadily all semester long. The Internet is a beautifully accommodating space for that! In Week 1, students browse through past projects to get a sense of the kinds of topics students have worked on in the past, along with the various web design options people have chosen. Then, in Week 2 the students start brainstorming their projects while also learning the basics of how to create a website. Next, in Week 3, they continue brainstorming, and they also experiment with some more website design skills. In Week 4, a plan for the project now in place, they write up an Introduction to their project, while also creating a homepage for their actual project website. 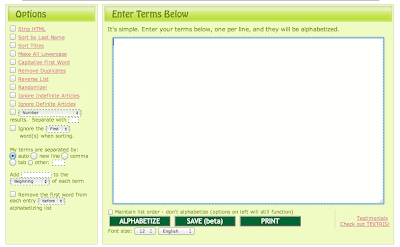 In Week 5, they revise their Introduction and add that as a new page at their website. Plus, they now start looking at each other's websites, offering suggestions and feedback. In Week 6, they are adding their first story to the site, and Weeks 6-13 consist of alternating writing and revision as they keep adding new stories. As they write and revise, they are also reading and commenting on each other's stories every week too. Then, at the end, in Week 14 they go back and revise the Introduction one last time, making sure it matches up with the final product. Week 15 then consists of final revisions: checking on links, images, bibliography, etc., as well as one last good read-through of all the pages. You can see details of all the assignments at my Storybook project page. 1. No trees were harmed in the making of these Storybooks. Seriously, the kind of revision-intensive process here would be depressing if it involved printing out reams of paper, but with the students creating and updating websites, the revision process is entirely natural. 2. Planning and revision take more time than writing. Notice that in the 15 weeks of this process, there are only 5 weeks which are "original" writing (Week 4, 6, 8, 10 and 12). All the remaining weeks are devoted to planning and revision. This is not the case in most college writing scenarios, sad to say. In most classes, students do no revising of their writing at all, and often the planning process is highly abbreviated or even missing entirely. That is a very unrealistic way to look at what is required for writing to be successful. The actual writing itself is easy! You just... write. What's hard is all the planning and the revision that is required to see a project through to completion. 3. Digital projects lead naturally to the creation of an archive of past student work. I consider the Storybook archives for my classes to be the single most important key to success. There is nothing more inspiring than to see great work by other students! Yet in most courses, what happens? Everything - EVERYTHING - just goes into the trash can at the end of the semester. Think for a while about what kind of message that sends to the students in a class. It is not good. Instead of throwing everything out, we need to send the message that what students are learning is of value, something worth keeping. If it is not worth keeping, then what was the point of doing it in the first place? O this learning, what a thing it is! Yesterday, I wrote about spreadsheets as a tool I use for developing content. 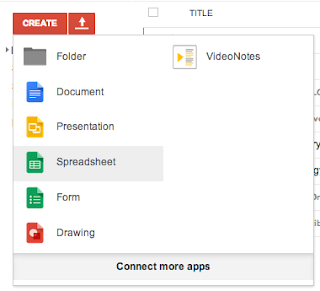 Today, I want to write about using spreadsheets for student data. I was prompted to do this because I received an email from Coursera that made me laugh: although that company claims to be gathering all kinds of "big data" about their students, I don't see them making very good use of it (see G+ post below with discussion comments). Meanwhile, the course management system we use at my school, Desire2Learn, does not really give me a way to manage student data either. The Gradebook is sort of like a spreadsheet, yes, but it has none of the functionality of a real spreadsheet. I cannot perform any truly complex/useful filters and searches. Worst of all: I cannot add my own columns to keep track of student data that really is important and useful to me. Real Name. A surprising number of students go by a nickname or use their middle name. There is NO WAY in Desire2Learn to keep track of the name that a student uses; instead, we can only see the "official" name on file. Until I started keeping track of this systematically, I had not realized what a large number of students use a nickname or do not even use that first name at all, choosing to use their middle name instead. I think it's dreadful that D2L does not let them choose a screen name that matches their real name. I cannot even keep track of their real name anywhere in D2L. Email Address. I keep an email address list here so that I can easily send emails related to data I keep track of in the spreadsheet. Introduction Post URL. It's important for me and for other students to be able to access the introduction posts students include in their blog at the beginning of the semester. I use this for my own quick reference and also to create assignments where students are looking at each other's introductions and commenting on them. Comment Wall URL. The Comment Wall is one of the most important features of the Ning that I use as my virtual classroom (there is nothing comparable in Desire2Learn, sadly - the profile pages are completely static, with no possibilities for interaction). I use the Comment Wall address for the different assignments where students are interacting with each other via the Comment Wall. Writing Assessment. In the first week of the semester, students complete a writing assessment. It is very helpful for me to view the results of that writing assessment as I give feedback to students about their writing throughout the semester, especially at the beginning of the semester when I am just getting to know the students individually. There are lots of other columns also, but they are kind of hard to explain outside of the context of my class and the specific information I do keep track of. And that, I think, is the single biggest problem with all the discussions I hear about "big data," including the self-congratulatory claims that Desire2Learn also makes about offering data-driven teaching tools. As a teacher, I really do rely on data that I collect about my students, but that data is closely tied to my teaching practices. It's not something someone can impose on me from the outside. In terms of a data tool inside Desire2Learn, I would need something a lot more like the customizable spreadsheet that I currently create manually using GoogleDocs. It's not a huge amount of trouble to create it manually, of course - but some of the data I am manually entering into the spreadsheet is indeed available in Desire2Learn, and there is much more data in Desire2Learn that I would love to use if it were easy to extract... but it's not. 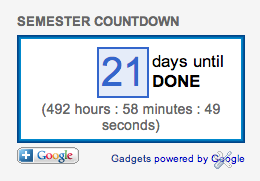 So, as often, I have to say THANK YOU to Google for making my job as an online teacher so much easier to manage. And nope, no thanks to Desire2Learn when it comes to student data. Maybe... maybe... they will someday figure out just how powerful a spreadsheet can be and will let us use the Gradebook like a real spreadsheet. Someday. Maybe. I was struck by an item in Inside Higher Ed today about the value of daily quizzes (see below). I'm not a big fan of quizzes, and certainly not of daily quizzes (ugh, the thought makes my head hurt...) - but I am a big fan of DAILY in general. I think that's why I like blogging so much; it is a form of writing that thrives on a little bit of daily discipline. I don't have a lot of discipline as a writer, but I can muster a bit of daily discipline. So, in terms of a digital tool, what I wanted to write about here today is how I use spreadsheets (Google Docs spreadsheets, to be specific) to support my various content development projects, most of which are daily content strategies, such as building content to use in my Class Announcements blog, my Bestiaria Latina blog, and my just-now-taking shape #foreignwordsinenglish project. Spreadsheets are a great way to keep track of stuff because they are, in effect, a kind of mini-database. Not a relational database, admittedly - but they are a database which you can sort and filter in all kinds of ways. So, for example, to support my class announcements blog, I have a spreadsheet with separate pages for each of the content items that I included each day in the blog: featured resource, featured Storybook, free Kindle book of the day, proverb of the day, Mahabharata image, and the calendar event of the day (details about the content here). For each category I need 105 items in order to be ready for the semester. First and foremost, spreadsheets are great for counting things! So, here is a screenshot of the "proverbs" page of that spreadsheet which gives me what I need to include the proverb in the announcements: the date, the proverb, and the link to the blog post with all the other details. I color-code the rows as I move through the semester (yellow is past), and I also have color-coded the proverbs from India so that I can make sure to have at least one proverb from India every week. That is just one example of how I use the different features of a spreadsheet to help me develop, use, and re-use my content. And in the spirit of growing things a little bit at a time, here's one of my proverb posters: Big oaks from little acorns grow. Prompted by a comment I left at Joshua Kim's blog at Inside Higher Ed (he often writes about audiobooks and ebook-related topics), I thought I would say something here about Google Books. The Google Books project was recently in the news, due to a welcome victory for Google in the legal war against book digitization being waged by the Authors Guild. That lawsuit has involved Google's use of digitized books still under copyright for search purposes. What I want to write about here, though, is the treasure-trove of public domain books that are freely available at Google Books, literally millions of books available for readers to use. I've used Google Books as the main content source for the last two books that I wrote (both of which are freely available for download in PDF): Mille Fabulae et Una: 1001 Aesop's Fables in Latin and Brevissima: 1001 Tiny Latin Poems. To write those books, I relied on literally hundreds of 16th-, 17th-, 18th- and 19th-century Latin books that I found at Google Books. I downloaded copies of the books in PDF and used the Good Reader app on my iPad (a tool I also need to write about someday) to take notes and harvest the content I wanted to use. Google Books is admittedly a mess, especially for people used to working in academic libraries. The curation of the books is slapdash, with many books completely mislabeled, which makes the search for books something of an adventure - but the thrill of finding just the right book is even more exciting as a result! Working on both of those books, I had more and better access to the books I needed thanks to Google Books than I did when I was a grad student at UC Berkeley which has one of the premiere research libraries in the whole world. Just as one example, here is a delightful anthology of distich poetry by Barthold Nihus, published in 1642, which was incredibly useful to me. The book is not 12 pages long as the entry seems to indicate; instead, it contains approximately 200 pages of Latin poetry, which means several thousand distich poems. 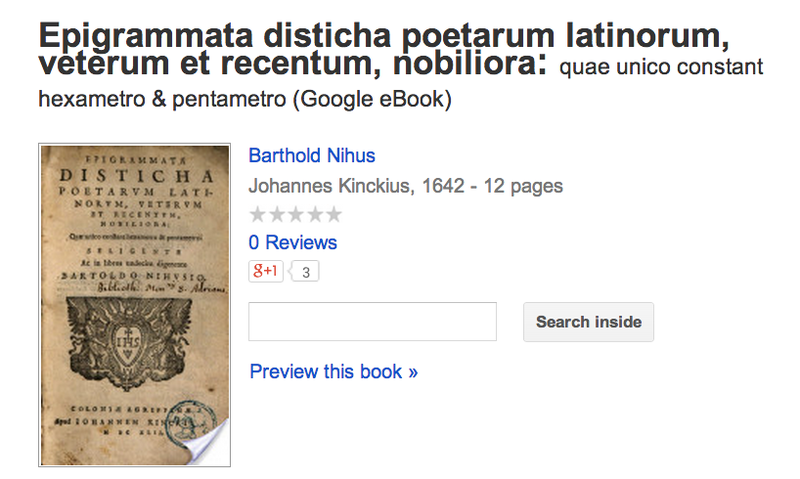 And this was just one of many treasures that I found diligently searching through Google Books, using every trick I could think of to find every volume of distich poetry, no matter how obscure - and neo-Latin poetry is pretty obscure stuff! In fact, writing about this makes me remember how much fun I had writing that book... and it makes me want to write another one just thinking about it. I could easily spend the rest of my life writing books based on the cornucopia of Google Books! I wanted to say something today about the power of embedded video since that is one of my favorite things about video: embedding it exactly where it needs to be! Inside a webpage, a blog post, a course management system - wherever! I really like video services that allow embedding (YouTube), and I am not at all impressed by video services that do not make it possible to embed videos. Yet when I included both those clips in the class announcements, it caused the display of the announcements to break inside Desire2Learn. I use the announcements blog as my landing page in the lower frame of my Desire2Learn course page (and yes, D2L is written in frames... believe it or not). It wasn't just that the offending video clip was not being displayed; the entire frame was completely blank and none of the announcements could be read. This was because, presumably, that Canadian Film Board video clip, embedded with iframe, came from an http source (not https)... so Desire2Learn, in its desire to protect my students from such dangerous stuff, decided to suppress the entire frame. I wouldn't have minded if it suppressed the video... but to remove all the announcements completely was a disaster! So, I had to remove that embedded video from the announcements, simply in order to appease the D2L security algorithm. As a teacher, that really frustrates me - another example of a machine algorithm trying to rule my life in a completely inappropriate way. I already keep my use of Desire2Learn to an absolute bare minimum... and this is exactly the kind of reason why. Luckily, the class announcements look great at Blogger, and it was very frustrating for me to have to remove the video from the announcements blog in order to appease Desire2Learn. I realized that I've written here about Google+ and Twitter, but have not said anything yet about Feedly. That's something I need to rectify. Feedly is, in fact, far more important to my news-gathering activities every day than Twitter is. Every morning, I check my email, Google+ and Feedly: they are as important as coffee! I've been using Feedly since July, that sad moment when Google pulled the plug on Google Reader. I had been a loyal user of Google Reader for many years (and before that, I had been a loyal user of Bloglines). In terms of keeping up with blogs, Feedly has been great; I don't have any complaints. I have hundreds of feeds organized into Feedly folders, just as I did with Google Reader, and the compressed view in Feedly (apparently built to accommodate the many Google Reader refugees like myself) works just fine for me. Diigo: I created a Diigo account a couple years ago, and I've got a nice Diigo extension installed in Chrome which makes it really easy to bookmark things quickly and easily on the fly. The place I most often find content I want to share with my students is Google+, so I make sure to bookmark with Diigo anything I want to find again later. Google+ is great, but its search features are really (REALLY) bad. If I don't bookmark stuff I want to use later, the odds of ever finding it there again are low. When I want to share something with my students, I bookmark it with the Diigo tag "announcements." Class Content Blog: As I've explained before, I have a big class content blog where I keep things I want to share with my students; I use a blog for that because it is fast and easy to manage. So, periodically I write up the content that I have bookmarked in Diigo, backdating the posts so that they are available for me to link to at any time. To make that easier, I use various blog labels to keep track of these posts. So, for example, I have a series of posts labeled "writing tips," etc. I use a blog like this in order to provide some commentary to help the students see just why I am sharing these items with them, how they connect up with the work they are doing in class, etc. From Diigo to Blog: So here's the trick I use to make this process work. I tag things in Diigo as "announcements" that need to go into the class announcements blog, and when I have written up the blog post, I add the tag "blogged." To find out what I have not blogged yet, all I have to do is search my Diigo bookmarks for "announcements NOT blogged" and I can see right away what's I might want to write up that I have not written up yet. I always have more resources available than I can keep up with, and Diigo patiently keeps track of all of that for me. I use the same process for the "Tech Tips" that I create for the students; these are actual extra credit assignments so they are part of my class wiki rather than the class announcements blog. So, as I learn about free browser-based tools that I might want to recommend to my students, I bookmark them in Diigo with the tag "techtip" and then I review them in detail later, deciding which ones to recommend to my students. That is a more time-consuming process, and I usually only have time to create new tech tips over winter break or summer break. Diigo is very patient, though - those items tagged "techtip" can sit and wait until I am able to get to them. The "announcements" items, on the other hand, are quick to write up as blog posts, so that are something I work on periodically during the semester - in fact, I will probably do some today because it is a fun and easy task. I used to be a very dedicated Delicious user and it was really hard for me to get used to using another service. Even though Diigo is a lot like Delicious, it took me several tries to really get into the habit of using it, but now I use it for lots of different purposes and projects; I'll try to write up some blog posts later about other ways I am using Diigo. Meanwhile, I cannot imagine trying to manage useful class resources without a tool like this, and one of my resolutions for next year is to find even more/better ways to take advantage of what Diigo has to offer! One of the tools I use most often in my work is GoogleDocs. My main reason for using GoogleDocs is that it gives me access to all my documents on each of my computers (desktop, laptop, Chromebook), but today I wanted to write about a different use of GoogleDocs: collaborative writing! 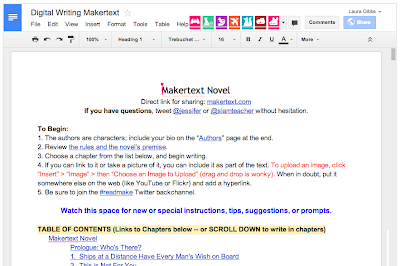 This weekend, I have been participating in a "flash mob" novel-writing experiment where people are collaborating on a novel together using a GoogleDoc. 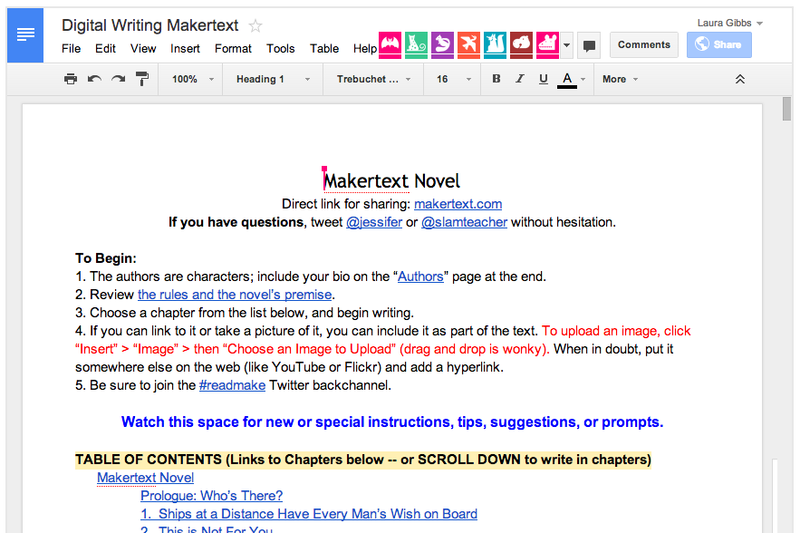 You can see the evolving GoogleDoc at readmake.com, and you can follow the discussion at Twitter with the hashtag #readmake. Here is a screenshot of the top of the document; as you can see there are all kinds of anonymous users working on the document right now, along with people logged in with their Google accounts. If you are reading this on November 16 or November 17, jump right in and join the fun! As we get near the end of the semester, I know the students pay more and more attention to the "Countdown Clock" in the sidebar of the Class Announcements blog (screenshot below). Especially since many of my students are graduating seniors (including some who are graduating this Fall semester), the countdown takes on a special significance for them. Since I wrote something yesterday about my tentative new use of Twitter, it made sense to write something today about my very dedicated use of Google+, which is my main hangout online, and so it has been since the very beginning of Google+ back in the summer of 2011. Google+ is an unusual platform, not easy to describe. To get a sense of how I use it, check out my stream here: Laura Gibbs. I post everything publicly, so what you see there is what there is. You don't have to be logged in or anything to see everything I have posted, along with the discussions that have ensued at the livelier posts. Google+ is very much like a giant group blogging platform... but it is not really like having a blog. It is also a lot like Twitter... but fundamentally not like Twitter. It really is just its own thing - and if you enjoy sharing with and learning from others online, I cannot imagine a better platform. Sure, there are features and improvements I would like to see (and there have been some great improvements added since they got started), but I enjoy Google+ so much as it is that I really cannot imagine a day going by without spending at least an hour there. I consider it my "daily hour of professional development," and every day I learn so much I never would have learned otherwise. Build a core Circle of people whom you really want to be connected with every day. I keep that Circle pretty small, and I use it to filter my incoming stream. On busy days (which is most days), the content from that Circle might be the only thing I read. From your own world, bring new things to share every day. That might be things you yourself are creating, or it might be experiences and ideas from your work, or it might be things that you are reading and discovering online. Everybody has something to offer, and Google+ benefits from everyone sharing what they find useful, thought-provoking, amusing, etc. Plus, comment, and reshare. I plus a lot of what I read, I comment often, and most of the time when I comment, I also reshare, usually pasting in my comment at the top of my share. If something is interesting enough for me to comment on, that means it is probably of interest to people who are following me, which means it is worth sharing. That is where the real power of Google+ happens, through the person-to-person networking and the human intelligence that filters the content being shared. Post publicly. Some people feel differently about this, but I post everything publicly, treating the Google+ space as I treat my own blogs. If there is something I don't want to share publicly, I don't post it. The advantage of this is that even people who are not using Google+ and don't want to actually join the network can still get the information value of the content that I post and share there, just like at a blog. Seek out new people. I find it really hard to get to know people at Twitter (140 characters! argh! ), but at Google+, people's post pages are really like a personal blog, often with long posts. To meet people outside my own circle, I often explore the pages of people who have left comments at the posts of people I do follow. This has been a great way to meet people whom I never would have met otherwise. I don't have time to keep up with all the interesting people I meet... in fact, there are way more people there than I could ever hope to follow, and I keep running into interesting new people there all the time. There is lots more I could say - and will say - about the specific strategies I use to get the most out of Google+ for my own learning, but that's a good list to start with I suppose. Meanwhile, someone happened to share a useful post at Google+ just yesterday about the many different strategies people use for creating posts, so I'm embedding that below here (this business of embedding posts is a newish feature at Google+ from just a couple of months ago; I really like it). As you can see, this is not a post I wrote, but one that was shared by someone I follow, and I then shared it again, which is why it shows up in my stream. I didn't write the post, and I don't even know the person who did - but my friend Mathieu provided the natural networking link that put me in touch with the post. The power of networking: I love it! This blog actually got started as a result of a defunct Twitter project at my school. Even though the project is defunct (in fact, I guess you could say it backfired), I've carried on using Twitter and have made it a part of my daily routine for a few weeks now. So, it looks like it is going to stick! I still find Twitter kind of strange and frustrating compared to the other social spaces I use and have used (e.g., Google+, Chatter, Yammer, and Ning), but it is turning out to be useful, especially for finding news and announcements about events happening at my school. Here are some things I have done that seem to have made this particular use of Twitter successful for me. Lists. The most important part of my Twitter routine is checking the two extensive lists I made related to my school: University of Oklahoma Programs and University of Oklahoma Faculty and Staff. My main Twitter routine consists of checking those lists periodically during the day. I follow some of these Twitter accounts, but primarily I check them via the list. Why aren't such lists compiled and maintained by the WebComm group at my school? Hmmmm... Anyway, I compiled them myself and they have proven to be very useful, although the large majority of accounts seem to be dormant. Integration with Blog Posting. Right now, I have several blogs that I update regularly, so I made a schedule for sharing a link at Twitter for new posts at these blogs (Bestiaria Latina blog, Latin LOLCats, GrammarCatz, Foreign Words, and also this Digital Tools blog). I also share from my class announcements blog when appropriate. I don't do this automatically; instead, I just tweet about the posts manually, and that also gives me an excuse to check in at Twitter periodically during the day. Following People I Know. It's been fun to follow people at Twitter whom I know either from Google+ and/or from their blogs. Some people really are good at creating a presence on Twitter, using the format very creatively. I enjoy reading their tweets and maybe I will even learn from them how to make good use of this insanely tiny space for expression. Don't Worry; Be Happy. Although I'm not really following very many people at Twitter, I don't even try to keep up with the stream. At Google+, I really do keep up with a core group of people, while also keeping an eye on the stream at large. At Twitter, though, I just kind of kick back and let it happen, without expecting to be able to keep up. That means Twitter feels less real to me, less about real relationships - kind of like eavesdropping and chatting with random people on public transportation as opposed to having conversations around the water cooler at work. Different, but still useful/entertaining in its own way! I am really inspired to use Twitter when I see how it is being used by the folks at my school who run the World Literature Today and Neustadt accounts (both out of the World Literature Today office). They post such great stuff, and I really like the way they share information about WLT events, but also all kinds of other literary news and information. The other OU accounts are focused on promoting campus events, really of interest only to OU folks, but the World Literature Today people are writing for a wider audience, and they are doing a fabulous job of it, too. I was expecting to see much more Twitter usage by the "WebComm" group at my school and other programs on campus that have made it a goal to make use of social media for institutional purposes. I'm glad to find what I have found, of course, but it is much less than I would have expected, given how quick and easy Twitter is to use. Maybe they devote their real attention to Facebook... and that's one tool I am not going to use. Twitter is fine by me; Facebook is not. Meanwhile, I'll update this post in a month or so when we see whether I am really sticking with Twitter as a part of my daily routine. For now, I have included below an infographic which might be useful for people who are thinking about getting started with Twitter. Twitter is certainly a space that is used by many educators, and this infographic has some good tips for educators who want to give Twitter a try. An Infographic That Summarizes Twitter For Teachers. In a previous post - Google Sites for Student Web Publishing - I explained how my students use Google Sites as a tool to publish their class projects online. I'm very happy with Google Sites as an extremely easy tool to use, while it is also one that allows for a lot of creative design and self-expression for students who want to explore those options. To get started, students build a sample Google Site in Week 2 of class. Here are the instructions I provide for building that sample site: Building a Website. For most students, this is the first time they have ever built a website, and they are really excited (and relieved) to find out how easy it is. Every semester, some students write me back about how they are going to use Google Sites to build a website for some other reason (another class, a student group, a family project, etc.). That makes me very happy! Then, over the course of the semester, I have some tips and tricks that I share with students. The list reflects the kinds of questions that students ask and the problems they typically run into. 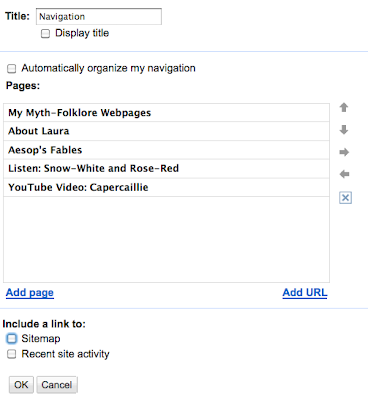 You can see my list here: Google Sites Tips and Tricks. 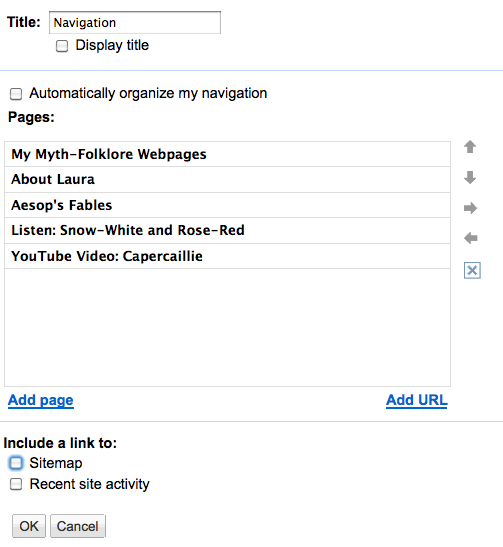 Do you have some help pages for Google Sites tips and tricks? If you do, leave a comment here! I don't actively use Google Sites for my own web publishing (I prefer blogging software, as I've explained in other posts), so I'm not the world's greatest expert on Google Sites, which means I am always looking to learn new things. One of the things that I like about Google Sites is that students can manage pretty much everything on their own using the basic instructions I've provided. I do very little technical support for their use of Google Sites, and of course they learn a lot by looking at sites created by previous students. I've mentioned in an earlier post two hashtags - #LatinLOLCat and #GrammarCatz - which I use for two different projects. The LatinLOLCat project has been running for a couple of years now, and I started the GrammarCatz project last summer (it was my grandson's idea). I use the Cheezburger.com site to create the graphics for both projects (and I guess I should write up a post about that sometime also! 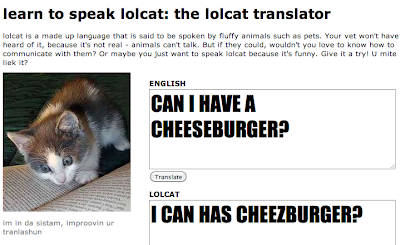 ), but for today I thought I would write up a site that is probably not so well known: Speak LOLCat: The LOLCat Translator. This is a simple little site that allows you to type in some English text which is then turned into all-caps LOLCat language. Now, I've gotten pretty good at doing my own LOLCat language over the past few months, but when I was getting started, this little tool was very helpful. I still use it as a way to remind myself to always spell "the" as TEH and so on, ha ha. Very handy. If you are curious about LOLCat language, it's an intriguing topic. There is even a LOLCat translation of the Bible! 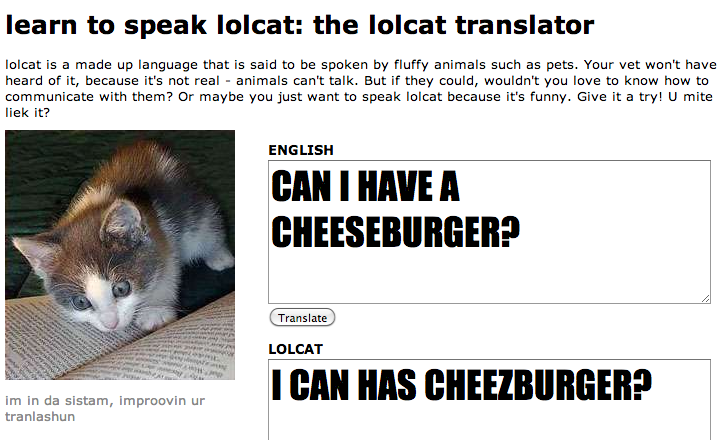 That project has a helpful webpage: How to speak lolcat. And be sure to take a look at this delightful video: I can has language play: Construction of Language and Identity in LOLspeak. One of my rules for this blog is "no tool too small" - in fact, sometimes it is the tiny tools that can be most useful. That is the case with the web-based tool I want to write about today: Flap.tv's Alphabetizer: alphabetizer.flap.tv. 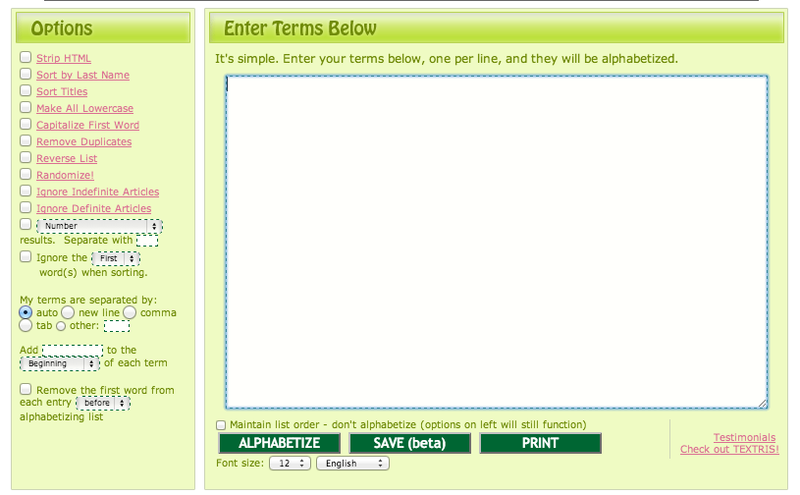 Don't let the name fool you: it is an alphabetizer OR a randomizer and, as you can tell from past posts, I love random. Plus, it will also remove duplicates (very handy! ), and it's very agnostic when it comes to how terms are separated in the list. I use this little tool several times every single day. It's just so much quicker and easier than messing with a spreadsheet to provide the same functions! So, for example, I keep online something I call "The Stack" which is a list of the student Storybook assignments I have in my to-respond pile. I need that to be a comma-separated list in alphabetical order, making it easy for students to quickly check and see if their name is on the list. So, I use the Flap.tv Alphabetizer to keep that list up-to-date, reconciling it to the pile of assignments I am working on at any given moment. That's a way I use the Alphabetizer every single day. I also use the Alphabetizer to randomize chunks of HTML such as rows in a table. So, for example, I keep a list of all the Storybooks in a class at my class wiki: Myth-Folklore Storybooks and Indian Epics Storybooks. Sometimes, though, I need to randomize that table listing for student commenting assignments. You can see the results here: Week 10 Internet assignment. It's the same table as in the wiki, but randomized with this tool. I just strip the HTML of the table down to its rows, with each row on a separate line, and then I use the randomizer to randomize those lines. After that, I add back in the table tags. Five minutes: all done! I know there are lots of other alphabetizer and randomizer tools online, along with other kinds of text transformation tools. I just happen to have found the Flap.tv tool years ago and I keep on using it. Count me a fan! I really wasn't sure what the students would make of that, but over the years I have seen students invoke this every week in their starting blog post for the week. "This week," someone might write, "I did not know what to choose, so I let the Fates decide." Or, "The Fates told me four times in a row to read the fairy tales!" It is both fun and funny I think, something both light-hearted and useful. Some students never consult the Fates, of course, but plenty of students do, even if just for amusement. By labeling this the "fates," of course, I am trying to make a point relative to the class. Chance was an incredibly important part of divination practices in the ancient world. 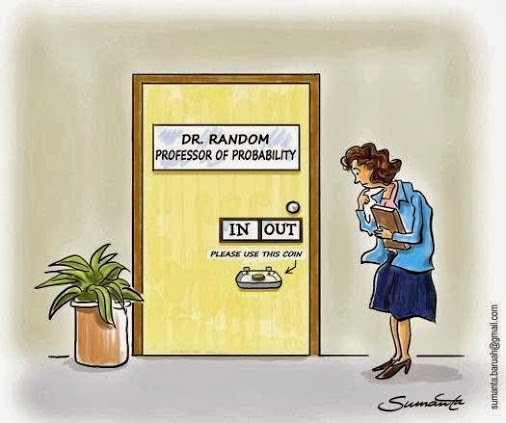 We believe in the statistical power of random, but in the ancient world, many people considered coincidences of any kind to be the work of the gods. Ancient divination is a topic that I am very interested in myself, so one of these days (argh... when?) I should write up a resource to share with my students, since I imagine they would find it intriguing too. In the meantime, though, they can let the Fates keep on deciding for them! The painting below shows Tobias and the Parcae (i.e., the Fates). 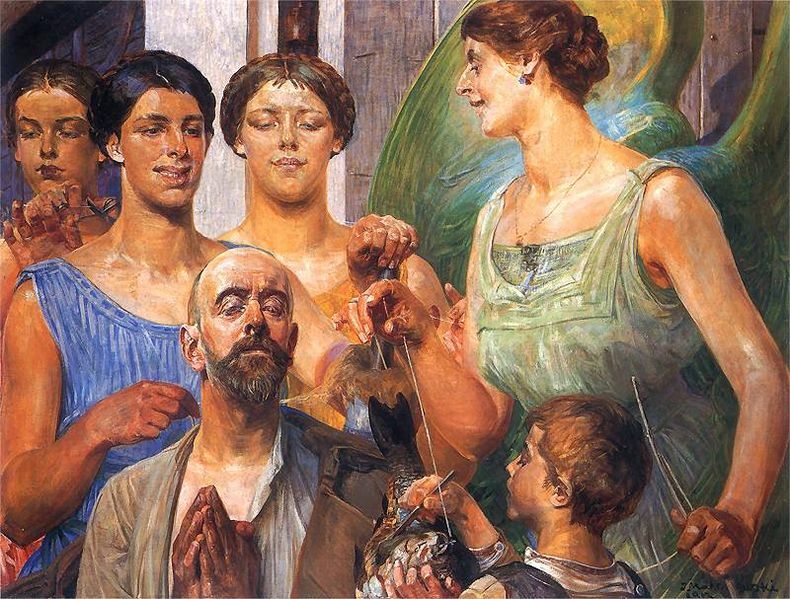 The artist is one of my favorites, Jacek Malczewski. I mentioned in a previous post how I use RotateContent.com to create randomized and date-based content to distribute in widgets that I use in my blogs and other webpages. I thought I would write up a note today about how I use RotateContent.com as a randomizer for class assignments, too. It seems to me that having a randomizer is an incredibly important tool for assigning student activities online, especially when you are not just sure which students will be participating. That is a very common situation in my classes because I try to give the students a lot of choice about just which assignments they do. So, because I don't know how many students will be doing an assignment, I can use a randomizer to spread that effort most effectively. That all sounds a little weird in the abstract, so let me give a concrete example of how I used the randomizer today when setting up assignment instructions today. Every week, students have an option of writing a "famous last words" blog post as an extra credit assignment. Then, every three weeks or so, I have an extra credit blog responding assignment where, in addition to their usual blog responding quota, students can read and comment on some of those "famous last words" post by their fellow classmates. Not all of the students write "famous last words" post, and it varies from week to week. Plus, not all of the students do the extra credit blog responding when it's available, and there's no predicting how many of them will opt to do it. Yet my goal is for all the students who do the "famous last words" posts to get as many comments as possible, distributed equally. It sounds hard... but it's easy, thanks to the power of random. I got some great news today (see embedded G+ post below for details) which was very affirming for me as a writing teacher. In both of my classes - Myth-Folklore and Indian Epics - the centerpiece of the class is a writing project that the students work on all semester: the Storybook. Each student chooses a topic of interest to them and then invents a way to collect and retell some traditional stories related to that topic (three or four stories, depending on the student's own preferences). Instead of me trying to explain the projects, just take a look and you can see for yourself what they are like: Myth-Folklore Storybooks and Indian Epics Storybooks. With just a few exceptions, the students use the free Google Sites website tool to publish their Storybooks. When I first started teaching these classes over 10 years ago, the students published these websites in their university-provided webspace, using Mozilla's Seamonkey Composer to create the pages. Sadly, my university turned out to be an unreliable host for such projects, and on a terrible day in August of 2010, just a few days before the start of school, campus IT deleted without warning hundreds and hundreds of past student projects, and when they were done, my archive of over one thousand projects was almost completely gone. I cried for hours; it was the single worst setback I have ever experienced as a teacher. Luckily, I had already started experimenting with Google Sites at that time because it had proved to be a convenient solution for students who did not have access to a laptop computer of their own and who were relying instead on computer lab access instead. So, starting in that Fall 2010 semester, Google Sites has been the tool of choice for almost all my students. The sites belong to the students, published with their own Google accounts (we do not have Google Apps at my school). Fortunately for me, the students are proud of their projects and almost all of them leave their work online. As a result, I once again have an archive with several hundred wonderful projects for the new students each semester to explore! This archive of student work is the single most important body of content for my classes, and I am very grateful to Google Sites for making it possible for my students to share their work this way. In yesterday's blog post about Kindle books, I included the Kindle eBook widget that I use in my class announcements blog sidebar, and I thought I would say something about the amazing tool that I used to create that widget along with the many other widgets and other randomized content generators that I use in my classes. It is hands-down my favorite content creation tool: RotateContent.com. Even better: it is freely available for anyone to use, thanks to its genius creator, Randy Hoyt. Randy was a student in my classes many (MANY) years ago, and we've been friends ever since. I hired him to build RotateContent.com back in what must be around 2003 or 2004, and it's been going strong ever since. I must have built a hundred or more widgets in that time, and even some of my oldest widgets are still going strong. Meanwhile, as promised above, here is Greek Beasts widget, a very old widget, one of the first that I created... and still going strong! You can learn more about the Greek Beasts widget at my Schoolhouse Widgets blog (yes, I really do put EVERYTHING in blogs, as you can see). 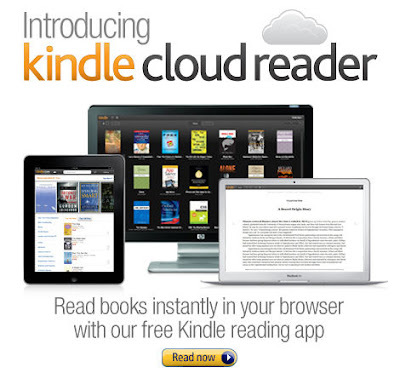 Free Kindle eBooks: What a Treasure-Trove! As I mentioned in my post yesterday about daily class announcements as class content, one of the items I include every day is a free Kindle eBook. I am so lucky that there are lots - LOTS - of wonderful books relevant to my classes which are in the public domain and available in lots of different digital formats, including free Kindle eBooks. I am really happy recommending ebooks to students in this format since Kindle books work well on so many devices - on a Kindle, obviously, but also on a handheld or tablet with a Kindle app, or on a laptop browser using the Kindle Cloud. It was the introduction of the Kindle Cloud that prompted me to start collecting Kindle ebook titles to share with my students; this is a format I am sure can be useful to every single one of my students. As for myself, I read a lot of Kindle books using the Kindle app for my iPad and my iPodTouch, but I also access Kindle books on my laptop and Chromebook using the Cloud. So, from personal experience, I have learned that someone can be an avid consumer of Kindle books without even owning a Kindle! Although not all the public domain books I would like to share with my students have free Kindle versions, most of them do! This summer, I will do another round-up and see if I can expand my listing to include some more free books. As it is, I have almost 200 books that I can recommend, and of those I selected 105 to use for the daily announcements (one for each day of the semester), coordinating with the reading topics for the classes and making sure to include at least a couple of India-related books every week. To support my use of the books in the daily announcements, I made a blog post for each book that I found; you can see the blog posts here: Myths & Folklore for Young & Old. That's another blog I have which may or may not turn into a book one of these days (I wasn't kidding about using blogs for everything!). Meanwhile, the blog's a handy place to list the books, including the table of contents for each one so that people can learn more about each book before they decide if they want to grab the free copy. I also created a widget (and I'll have plenty to say in other posts about RotateContent.com, the free tool I use to create my widgets) which allows me to feature the Kindle books in the sidebar of my class announcements blog. Here's the widget; every time the page refreshes, you'll see a new one of the Kindle books at random. Each listing in the widget contains an image and a link to the Amazon book, plus the blog post which provides more information. Yesterday, I wrote about how I use blogs to develop content that has evolved into book form, with the blog providing a space for the development and re-iteration of the content, thus allowing it to improve with each iteration. In this post, I want to talk about how I use a blog to develop class content in the form of daily class announcements. I've used daily class announcements since I first started teaching online courses over ten years ago. At first, I did announcements for Monday-Friday, but now I do new announcements every day, including Saturday and Sunday, because most of my students do course work over the weekends. I remember showing my announcements many years ago to another online instructor, and she was baffled. "How could you have something to say every day?" That question really surprised me: how could I not have things to say every day, and how could I miss such a valuable opportunity to communicate with students? I rely on the daily announcements not just to reinforce the immediate goals of the class but also to educate students about the Internet as an infinite learning resource, a space for learning that I hope they will continue to use long after the class is over. So, before you read any further, take a look; here is my class announcements blog: Online Course Announcements. It's a Blogger.com blog, and I've been using the same blog for over five years now (although, as I've said before, I'm platform-neutral; any blogging software will do, and I used different blogging platforms before setting on Blogger). With blogging software, all my previous announcements are accessible to me. That means I can build and grow the content from semester from semester, and from year to year, both recycling AND improving the contents of the announcements along the way. So, I do a lot of copying-and-pasting, but I also do a lot of editing, while gradually adding in new kinds of content every semester and removing content that I am less satisfied with. In terms of course content development, I consider doing the announcements one of the most fun aspects of the class. In-between semesters, I look forward to developing new content, and each day as I write the announcements during the semester, I enjoy seeing how it all fits together. Overall, I would say the announcements have a big impact on the class. At a minimum, it shows the students that I am aware of the flow of the class from day to day, every day. I am never checked out (even if I myself don't do schoolwork over the weekends), and I want to make sure they have the information they need, no matter what personal schedule they are on as they do the work for the class. I don't expect that any student would or even should read the announcements every day, of course, so I do repeat important news items if I need to make 100% sure every student in the class is aware of them. Beyond that bare minimum of checking in and basic reminders, the best part of the announcements is all the other "stuff," the class content that comes through day by day, showing that there is an endless supply of things to know and learn about the topics of the classes I teach. The two classes I teach - Mythology & Folklore and Indian Epics - are interrelated enough that it is easy to do combined announcements for both, and I am actually really glad that the students in Myth-Folklore get to see the content related to the Indian Epics class, and vice versa. Reminders and Procedures: These are what most people probably think of when they think of class announcements - reminders about due dates, answers to questions students have asked, etc. Online Resources and Tools: Since I am an avid consumer of online resources and tools, it's exciting to share those with students. Some of the items are specifically course-related (like great websites to use for research), while others have a more general purpose (such as browser-based tools for working with text, editing images, etc.). Since my classes are writing-intensive, I also feature a lot of writing tips here. Featured Storybook: This allows me to feature wonderful student work, both from past semesters and from the current semester. At the start of the semester, I feature past projects, and then as the new projects for the semester get underway, I feature a mix of both past and current Storybooks. Free Kindle eBooks: I have collected a list of free Kindle eBooks with mythology and folktales from around the world, including India too of course, so that there is a new free ebook every day. I like the Kindle format because it is very device neutral; I'll say more about that choice in another post. Indian Epics Images: We read the Ramayana and the Mahahbarata in class, so I have a new image from the image, aligned with what the current reading assignment is in class. Indian art is a beautiful tradition, and it is often new to students in the class. I am really happy that the students in Myth-Folklore get this exposure to Indian art, in addition to the material they are covering in that class. Campus Event: I look for some kind of campus event to include every day. This is not easy because our Campus Events Calendar is badly underutilized and I think, in fact, it may be broken (on the day of Homecoming, not a single event was listed; I haven't gotten any really clear answers from the people in charge of the calendar about just what is going on). Luckily, the students help me out by sending me items to include from events they are involved in, and I am now using Twitter to learn about campus events, too. Date-Related Item: I try to close with some kind of holiday or other date-based observance to call attention to the calendar date. I include all kinds of items under this heading: religious and secular holidays, the dates of historical events, the birthdays of famous artists and writers - anything at all that is prompted by the actual calendar date. So, that's how my announcements are working for this semester. Next semester, it will be mostly the same... but also different, as I continue iterating, improving the content every semester. In upcoming posts, I'll say a bit more about how I developed all this content and the specific tools that helped me to do that. As I've already mentioned in a previous post about my new #foreignwordsinenglish project, I should be adding a word etymology to the announcements every day next semester (with a focus on words that English has borrowed from India, but from other languages around the world also). While I'm sure that for other types of classes textbooks are a great content-delivery vehicle, I am convinced that for my classes and my style of teaching, it is actually the daily announcements that are a better way for me to share content with the students, offering them something of myself, my interests, my knowledge, and my goals in teaching these classes. Moreover, even in a specialized course with a much more narrowly defined content focus, I still think there is a role that daily announcements can play, helping to make students aware of the issues that are important in a given academic discipline, sharing with them news of scholarship and important discoveries, alerting them to whatever resources are available online for them to deepen and broaden my studies, etc. etc. etc. With daily announcements, it is all about etc. in fact! That's how it seems to me anyway. I cannot imagine an online course that does not take advantage of the communication channel made possible by daily announcements for a class. If everybody learns even just one new thing every day, what a wiser world this would be! Every day a person grows more wise. Polish: Co dzień człowiek mędrszy. If I were to name just one tool that is most essential for my work both as a teacher and also as a writer, it would be BLOGS. It is fitting, of course, that I am making that pronouncement in... a blog post. I am using Blogger.com to write this blog post, but I am really platform-neutral when it comes to blogging. I use Blogger.com because it is convenient and familiar, but I've used other blogging platforms in the past and no doubt will do so in the future. So, since blogging is a huge part of my online life and something I am very enthusiastic about, I will eventually come up with a series of posts on this topic, but I will focus here on one specific subject: websites, blogs, and books. When I first started creating online content back in the fall of 1998, I was using Netscape Composer to create webpages and websites. It was a simple tool, easy to use, a lot of fun; I learned about it in an afternoon workshop in Moffitt Library... an event that changed my life more than anything else that happened in my years of graduate school! Looking back, though, the websites I created over the years are stalled out, clunky, awkward, and getting seriously stale. Why? Because I am just not a design person, and the time and talent it takes to build and sustain a website is beyond me. So, alas, all those websites I lovingly built in the increasingly distant past are showing their age more and more with each passing year. I lack the incentive and, at this point, even the technical ability to salvage them (they are built mostly with a by-now ancient version of Dreamweaver). But when it comes to CONTENT... oh: I am a very happy generator of content, limited only by the speed of my typing - and I type pretty fast! That is why blogging suits me: with blogging, all I really have to worry about is content. 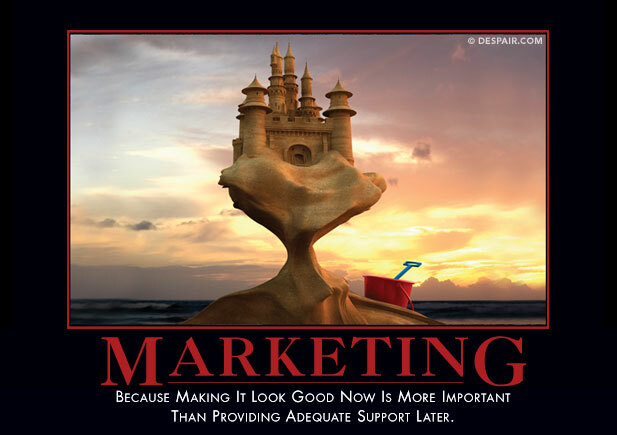 I can let the blogging software manage the design issues for me, along with other site maintenance tasks. Since I shifted all my content development and web publishing to blog-based platforms about four or five years ago, my productivity has increased dramatically... along with my overall web happiness! Unlike a website, I don't expect a blog to last forever, and I don't think about my content as really lasting forever either. Instead, I see my content as evolving, both expanding and deepening, as it runs through multiple iterations, taking on new forms in each iteration, while blogs make the evolving content accessible and usable throughout that iterative process. That all sounds very abstract, so let me give just one concrete example, based on the last book I published. The book, which is available for free in PDF form and in print from Lulu.com, is entitled Brevissima: 1001 Tiny Latin Poems. Of the six books I have written, this one is hands-down my favorite, and that is in large part because the process I used to write the book was such a pleasure from start to finish. Let me try to explain how I got to this book via blogging, and how the book is a part of my blogging even now. Brainstorming the book. I have a long-standing blog, Bestiaria Latina, where I experiment with all kinds of content, especially short-form content. I am brainstorming and experimenting all the time with that blog. When I find something that sustains my interest for months and months, it becomes a candidate for a book! (I have written five books this way.) One of the types of content I was collecting and sharing in that blog consisted of Latin distich poetry, little two-line poems. I was so interested in those little poems that I created a separate blog for them. Writing the book. The blog I created was originally called Disticha Latina, although the name you see now at the blog reflects what eventually emerged as the title of the book. Initially, though, I was not even sure there was going to be a book. Instead, the blog was just a place where I was transcribing two-line poems from different Latin books I found online as I explored and learned more about this genre of poetry. I have created a lot of dedicated blogs of this type; maybe one in five has eventually turned into a book. Curating the sources. 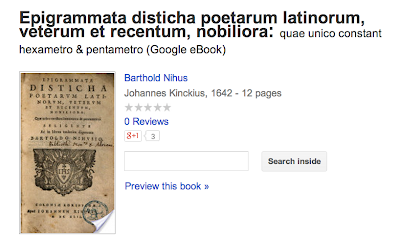 Meanwhile, in an existing blog called I Love Google Books, I kept track of the many Latin poetry books I was finding online and which I was using as sources for my distich project. That blog is dormant now, but I have used it to support several different projects in the past, and it will no doubt spring to life again when I have need of it for more bibliography research and curation. THE BOOK. After working very hard just reading and transcribing for about two years, I then was ready to create the book, which I did in the summer of 2012. I did not do a lot of blogging that summer. Instead, I used a database to support the creation of the book and I learned a lot about book formatting with Open Office so that I could achieve the specific left-right layout I wanted for the pages (poems on left, vocabulary on right). This is the kind of work I can never do during the school year because of the concentration and long periods of uninterrupted work time required. So, I spent basically all summer working on the book and finished it up in early August. Blogging the whole book. Then, when the book text was done, I started blogging the book again at Disticha Latina. What this meant was that I went back through the several thousand posts at the site with individual poems and updated the 1001 posts that contained the actual poems which made it into the book, building post-to-post navigation that would mimic the page-by-page navigation in the book. That took about a month or so, and I now consider this blog to be essentially done; I don't do work on it anymore, although I do have an errata list there (few errors found so far, I am glad to say). I also created posters for 250 of the poems and included them in the blog posts. Blogging the book in pieces. So, I have now come full circle, and the poems and posters from that blog are a regular feature in the posts at Bestiaria Latina. Each time I create a new post for the Bestiaria blog, I include one of the posters for a distich poem, linking to the specific post at the Disticha blog that contains the poem, notes, and vocabulary... along with 1000 more of those tiny Latin poems! Meanwhile, here's one of the poems from the book and an accompanying poster; it's a poem that explains a lot about why I love my career as a teacher. Quod numquam didicit, nemo docere potest. what they have never learned (numquam didicit). This is such a wonderful visual medium to work with, and for the past year I've been creating hundreds of proverb-based posters, in English and in other languages too, using Wigflip's Automotivator tool. The tool is very easy to use, and if you start with a high-res image you can even use it to generate a poster for printing, not just for use on the web. I've tried out other poster generators (there are lots, of course), but this one is simple while giving me the features I need. This poster-maker is a tool that I recommend to my students as an extra-credit Tech Tip. After all, why look for existing posters to express your ideas when you can create your own? Meanwhile, the blog space where I keep my posters is The Proverb Laboratory (which is also where I keep my LOLCats; I'll say something about that in a separate post). I re-use many of these proverb posters in my class announcements, with one new poster every day. 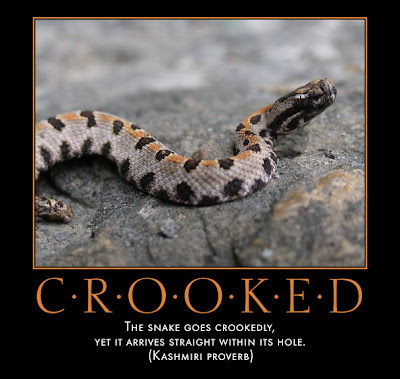 Here, for example, is today's poster - it's a proverb from India (which is nice, as one of the classes I teach is Indian Epics): The snake goes crookedly, yet it arrives straight within its hole.